As if you haven't seen enough pics as it were... Isn't this just the cutest pic from the wedding? 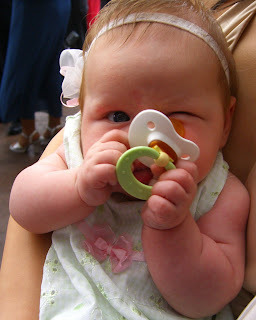 She's grasping things better all the time - bad when it's the paci she cries when it comes out of her mouth! We stopped off and saw Auntie Kristin as our final stop on our way home - definitely better with someone in the back seat... bad sign when the kid is screaming before you get off the curb into the car! My mother wanted to know how much the kid weighs - it feels odd to put your kid on a cookie sheet. On the postal scale, she weighed 11.2 lbs. She has definitely chunked up lately. And for those of you who haven't heard the story... part of my new life-with-baby schedule. And the lesson is - when all those little mommas and daddies walk in to church at all weird times late and you're tempted to judge and tell them to be on time, just remember you never know what they have gone through already! Before 7:30 Sunday morning, I had fed a baby, changed a baby with poop up her back, wiped down a baby with a wipee as a semi-sponge bath, given a bath to a baby who peed all over herself during that attempted sponge bath, given in and wiped a baby down with a soapy washcloth, washed her hair in a sink, been peed on (all down the leg) during that hair wash... and then ended up late to church cause I can't follow directions - or I'm too stubborn to look at them since I "know" where I'm going... hmmm :) ... A fun morning! Weekly update: she's very alert (people say more than expected for her age so I take their word for it), holding up her head pretty well, pushing up and looking around, recently discovered fans and lights, poops a lot!, and is grabbing just in the last several days. The little booger actually rolled onto her belly today when she pulled herself over trying to reach and eat the comforter on the bed. She almost did it a couple other times too - I'm calling it stubborness. How could she be immune with parents like hers! Seems to happen when she sees something she wants to chew on - now due to actual ability. Or she could just be way ahead the curve! And the award goes to the person who invented my baby car mirror!!! It plays music via remote I can push in the front seat and has a mirror she can look in - calmed her down quite a few times in the car. If only the music wasn't so dang annoying!!! If you need a gift for someone, this is the thing to get I promise!